For other "Gold Coasts", see Gold Coast (disambiguation). 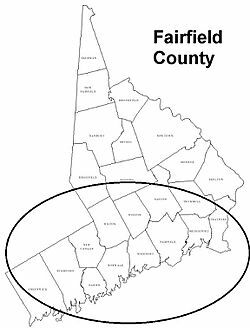 Although the term "Gold Coast" could apply to any of the thirteen parkway municipalities, the distinction of being called the wealthiest town in Connecticut can be attributed to the panhandle: either Darien, Greenwich or New Canaan, depending on the statistic used. With waterfront generally having the highest property value and coveted direct access to the New Haven line and Interstate-95, Darien and Greenwich boast a lower mill rate and are generally more sought after than New Canaan. However, property value is not the only way to determine which is wealthier, and it does become difficult to compare the three with each having drastically different land area, or with Greenwich having three times the population of Darien or New Canaan. With more land area, average home values in New Canaan may be higher than Darien, but not the price per square foot. With a higher population, a larger demographic weighs greater on the median income in a town like Greenwich. This plus the 47 square miles in land area makes Greenwich essentially incomparable. New Canaan is also given an advantage, being well over 50% larger than Darien but still having a similar population. According to the 2000 US Census, New Canaan was first in per capita income ($82,049), Darien second ($77,519) and Greenwich third ($74,346). According to the Connecticut 2014-15 Adjusted Equalized Net Grand List per Capita (AENGLC); Per Capita Income for Greenwich was $91,478, Darien $94,376, and New Canaan $99,016 the highest out of the 169 towns in Connecticut. However, per capita income does not take into account personal assets; homes, jewelry, art, boats or automobiles. Greenwich has the lowest mill rate, which may indicate higher property value, with Darien ranking second. In 2000, New Canaan had a higher percentage of resident homeowners (83%) than Greenwich (69%), which may indicate more wealth. According to some sources, the wealthiest town along the Gold Coast should be New Canaan because of their higher rate of home ownership suggesting a higher level of personal assets. More recently, another source named Darien the state's richest town in 2011. An additional consideration is to measure wealth per person - not aggregate town wealth. Both the Adjusted Equalized Net Grand List per Capita (AENGLC) Wealth Value and the CPR AENGLC Wealth Value, show that Greenwich has the highest wealth value in Connecticut at over $430,000 per person. The AENGLC is based on the value of residential and commercial real estate, and measures the town's tax base available to pay for public education (see Conn. Dep of Ed). It is not a measure of the personal wealth of individual residents. Yet another definition for the Gold coast is the one provided by the University of Connecticut's "Five Connecticuts" study, which indicates that the area are the "wealthy," or blue towns. These are Greenwich, Darien, New Canaan, Westport, Weston, Wilton, Ridgefield, and Easton. A last method is to check the planning regions. This yields very similar results to the above method but adds Stamford and Norwalk while subtracting Ridgefield. A 2015 Connecticut Post article named Darien the snobbiest town in Connecticut. Gold Coast (Connecticut) Facts for Kids. Kiddle Encyclopedia.